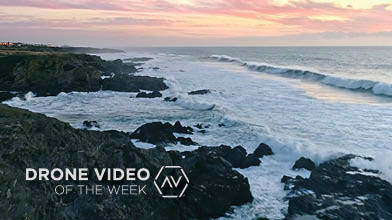 Our Drone Video of the Week Contest picks the Top 5 uploads over a selected timeframe. Fans vote for their favorite video to win $250 and the title of Drone Video of the Week in 2019. This week's nominees include: daniele bolgia, Upper Cut Productions, gareth hayman, Boyanoo, and Madebyvadim. Description: Welcome to EP 2 of the 2019 Drone Video of the Week Contest! Each of these nominees has a chance to be named Drone Video of the Week and grab the $250 prize. Vote for your favorite: The dolomites at sunset by daniele bolgia is truly a calm and beautiful vision. Next up is Showreel 2019 by AirVuz newcomer Upper Cut Productions. This reel is packed with variety. Another new face to the AirVuz community,” gareth hayman wowed us with Fly // China & Hong Kong edition. Simply remarkable views, especially the night shots! Boyanoo takes us with him on his epic adventure with A year well travelled 🤟🏼. Amazing. It's a must watch. And last but not least is Madebyvadim with Element. A beautiful film that focuses on the 3 main elements. Relax and enjoy. Want to watch all 5 nominated videos? CLICK HERE CLICK HERE to vote for your favorite video. Voting runs through Sunday, February 3rd at 11:59pm CDT. The winning video will be announced on Tuesday, February 5th.